1. Cut a 15x15cm piece of backing paper, mat and layer with a 14.5 x 14.5 cm piece of backing paper, adhere to the card blank. 2. Cut a 12cmx12cm piece of backing paper, mat and layer with an 11.5cm square of backing paper, adhere to the card. 3. ATrim an 11cm x 8cm strip of backing paper and then adhere to the centre of the card. 4. Stamp the sentiment, cut out, make a hole in the circle then thread with twine and add the bells before tying a bow. 5. Die cut 3 baubles from the glitter & foil effect paper, adhere to the strip of backing paper, in a row using foam tape to add dimension. 6. Add a row of gold pearls to each of the baubles to finish. 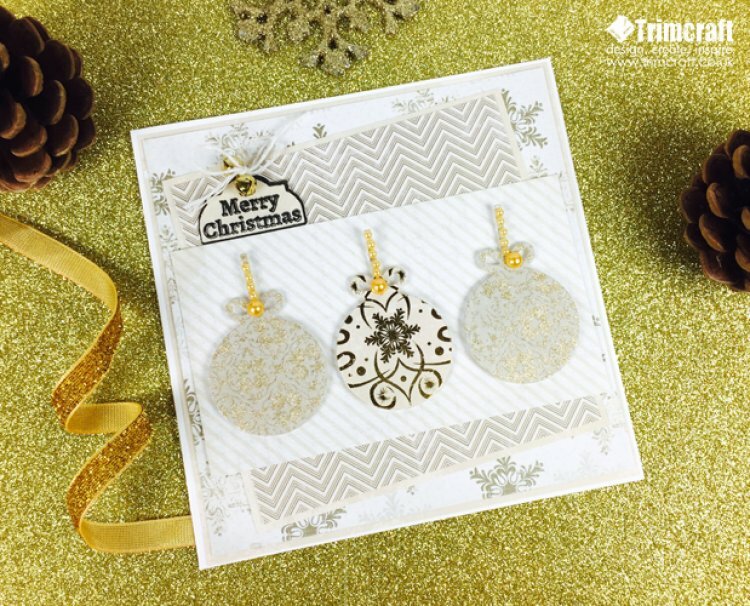 Try mixing different papers from your paper pack to create a variety of different cards, we love to see your projects so don't forget to share your Christmas makes with us in the project gallery.